Mario Mauro, vice president of the European Parliament, will give the inaugural European Union (EU) Lecture sponsored by the University of Notre Dames Nanovic Institute for European Studies at 4:30 p.m. Sept. 29 (Monday) in Room 129 of DeBartolo Hall. Titled “The God of Europe: Christian Roots and the Future of Europe,” Mauros talk is free and open to the public. The EU Lecture Series is devoted to furthering the knowledge of students, faculty and other members of the Notre Dame community about the history, nature and future of the European Union, with particular attention to issues of interest for both EU institutions and the Catholic Church. 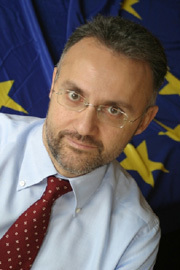 Mauro was elected to the European Parliament in 1999 and served as vice president of the Culture and Education Committee for five years. In 2000, he was chosen by the U.S. State Department to represent an exchange program for European-American politicians.He became vice president of the parliament in 2004 after his second election and was awarded the delegation for theRelations with Churches and the Religious Communitiesfrom the parliament president in 2007. Mauro is strongly committed to education, economics and culture and continues to teach human rights and international conventions at the European University of Rome. According to Anthony Monta, assistant director of the Nanovic Institute, this series puts Notre Dame’s students and faculty into direct contact with leaders in Europe’s political and administrative institutions that deal with contemporary European dynamics. The EU visitors will give public lectures, visit classrooms and meet with faculty and students. Originally published by Jennifer Lechtanski at news.nd.edu on September 22, 2008.